Yesterday was the ACRL (Association of College and Research Libraries) New England Chapter Spring 2011 Conference at the College of the Holy Cross in Worcester. This was my first library conference and, other than having to get up extra-early to drive to Worcester, it was a great experience. I met and talked to several librarians, some of whom were Simmons GSLIS alums, all of whom were friendly and interesting. I also especially enjoyed one of the morning breakout sessions, where Judy Montgomery and Rebecca Sandlin from Bowdoin College in Maine gave a presentation strategies for collaboration between the library and IT department. Some of their tips: collaborative strategic planning; identify core shared values; leverage positive relationships; collaborate visibly on projects; reward collaborative projects and attitudes; and have equal partnership to preserve both cultures. Bowdoin’s LIT (Library/Information Technology) partnership would have been a great example to study in the Principles of Management class at Simmons: an organic process of real leadership, thoughtful collaboration, and internal buy-in, rather than a top-down forced merger. Overall, the ACRL conference was a great learning experience – and a chance to get my feet wet before ALA Annual (next month!). Tomorrow, the digital library we have been building in LIS-462 is officially launching! Over the course of the semester, the class has digitized the scrapbook of Caroline Stokes, a student at Simmons from 1929-1933. We’ve done everything from digitization to metadata, writing content to creating the database and website. It has been a huge effort but a great learning experience. View the Caroline Stokes Scrapbook here. 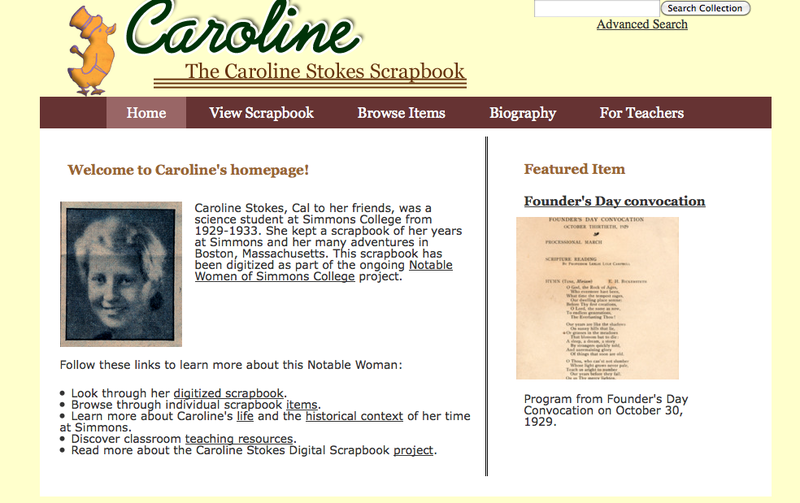 The Caroline Stokes Scrapbook home page. The GSLIS Tech Lab streamed the Berkman Center for Internet & Society webinar “Academic Uses of Social Media: Exploring 21st Century Communications” this afternoon. John Palfrey, faculty co-director of the Berkman Center (and author of Born Digital ), gave an introduction and noted that, when looking at the growth of social technologies, it is important to keep in mind the digital divide (which so often corresponds to the socioeconomic divide). Boyd also talked about the creation of a new kind of public space; its persistence over time, its replicability, searchablity, and scalability. She also spoke of the invisible/imagined audience, the collapsing of contexts, and the blurring between public and private, and how “young people” are participating in a public environment but still want privacy. One of the most interesting points she made was that face-to-face interactions are private by default and public by effort, whereas interactions through social media are public by default, private by effort. She, too, emphasized that not all young people are “digital natives,” and that even because they use certain technology doesn’t mean they understand it: for example, one can use a search engine every day without really knowing how to structure a query properly. Near the end of her lecture, Boyd showed a slide with this image: “Replace fear of the unknown with curiosity.” The source appears to be a blog concerned with celebrity news and fashion, but it’s an excellent position to take, all the same.